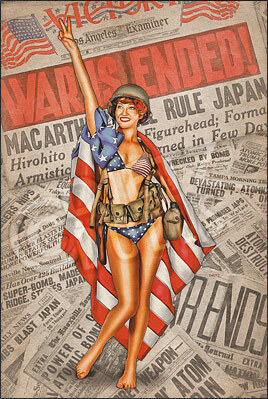 Airbrushed style pinup photo tribute to the 70th anniversary of V-J Day (Victory over Japan). The UK celebrates VJ Day on August 15th as the end of the war, while the official United States surrender documents were signed on the USS Missouri in early September. Here Anna is celebrating the victory with a 'V' hand sign made famous by the UK Prime Minister Churchill during the war. Newspapers all around the United States celebrated the August 15th war end with various PEACE and WAR IS ENDED headlines in bright colors. It was a time of celebration that World War 2 was finally coming to an end. 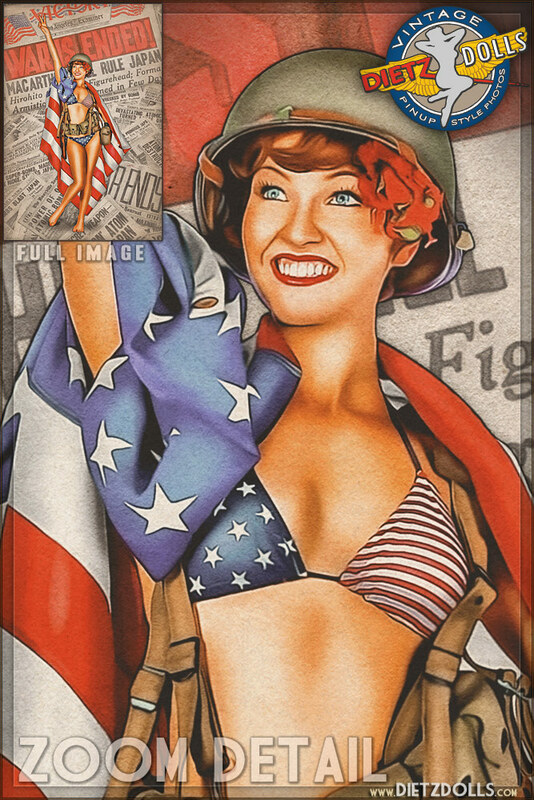 The Dietz Dolls Military Pinup series celebrates the rich history of the United States Military during World War 2 with the Army, Navy, Army Air Force, Marines, and Coast Guard. Using authentic uniforms and equipment, this series is perfect for the military fan to hang framed on their wall!